1. A 20% non refundable deposit secures your booking. 2. Final balance payable 8 weeks before your holiday arrival date. 3. We accept payment by paypal / bacs or cheque but funds must be cleared 8 weeks prior to arrival date. Lounge is open plan, fully fitted kitchen with breakfast bar and leather stools, dining area, two reclining leather sofas which could possibly be used as beds, Samsung 55in smart TV with back lights, DVD Player, Dab Radio and sound system, double French doors which leads out onto the decked veranda, garden / patio area with uninterrupted views over Torbay. Main bedroom has en suite shower room with w.c. wash basin heated towel rail, a king size bed, dressing area two wardrobes and dressing table with drawers - view across the bay. Second bedroom has full size twin beds, wardrobe and drawer space - view across the bay. 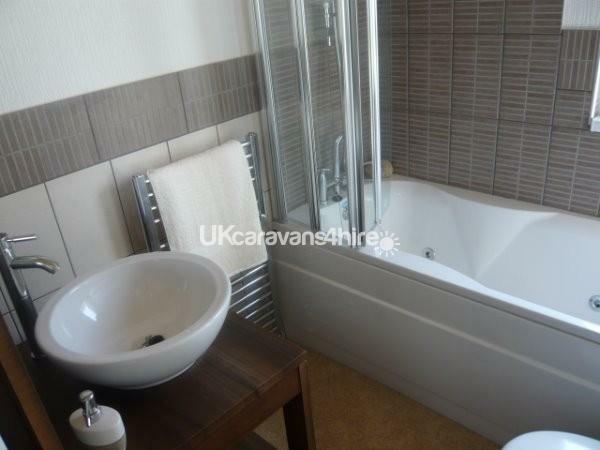 Main bathroom has a Jacuzzi bath with shower, basin, w.c. and heated towel rail. The kitchen is fully equipped with excellent tableware and cookware, nespresso coffee machine ,large fridge freezer, washing machine, 5 burner gas hob, electric oven & grill and microwave oven. We also have our own private parking space which leads to a level pathway to the lodge, very good access for disabled. FREE mains supply for electricity, water and gas central heating with thermostat control. 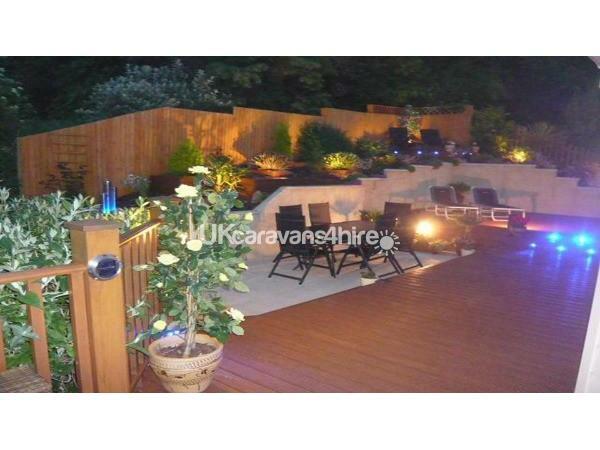 Outside space is very large and private - entrance to the lodge is through a private gate which leads to the garden area, 3 steps up to the decking and front door. The decking then continues around the front of the lodge where you will find a row of rattan furniture and unobstructed 180 deg views over the bay. 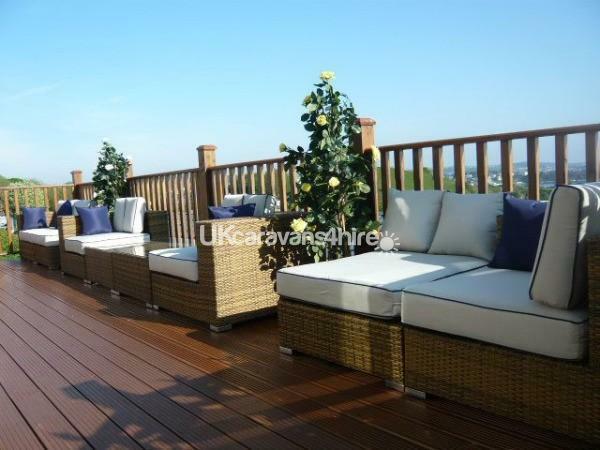 The decking continues around the other side of the lodge where you will find a large private patio sunbathing area and landscaped gardens, up one step onto a large decking area with 6 chairs and table for al-fresco dining or barbecue. Through the landscaped garden you will find a few steps which leads to 'the perch' which is a raised decked area with two bench seats and table - here you will find outstanding views over the bay, while enjoying the evening sun with a glass of your favourite - not to be missed !! Please note: the upper decking / 'perch area' would not be suitable for young children unless fully supervised by an adult. Stunning!! Beautiful lodge with stunning views. Set in a peaceful area of the park, everything you need is included,we didn't want to leave. Would definitely recommend Thank you for a lovely holiday. Thank you Tricia for your feedback We are so pleased you enjoyed your week at our lodge. We hope you will visit us in the very near future. Where to start? This lodge is amazing, beautifully furnished, beds and sofas are so comfy. There was everything there that we could possibly need, including bath and beach towels, everything is of the highest quality. I would definitely recommend this, thank you for a wonderful holiday. Thank you Dominique for your feedback We are so pleased you enjoyed your week at our lodge. We hope you will visit us in the very near future. Wow! Where to start. Amazing views worth every penny we paid to stay there. 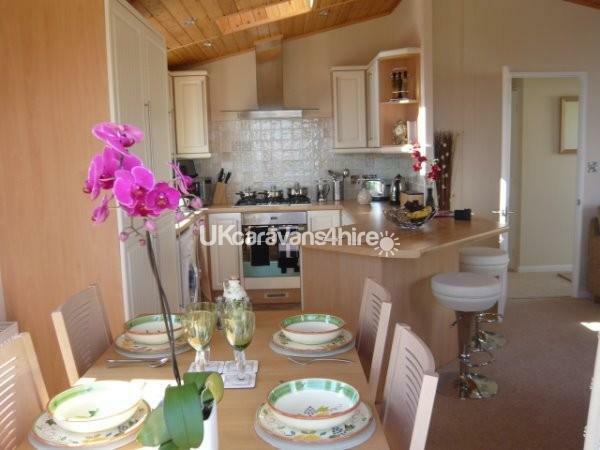 The lodge is spacious, clean and homely and has a modern feel. This even worked with my 2 year old. He loved the train going past several times a day. We didn’t want to leave. Our stay was that good we are already looking to rebook. The owners were extremely helpful providing info and answering any questions. Had a great week. 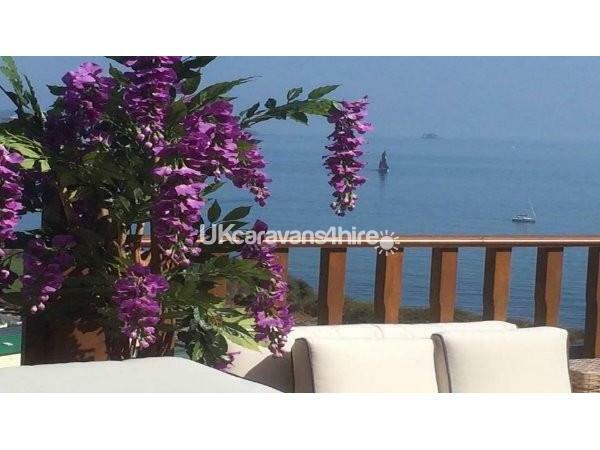 Everything available to make a great holiday.many thanks to the owners. Roy and Angela. Stayed in this fabulous lodge last week. The accommodation is superb and well equipped, with quality being of the essence. 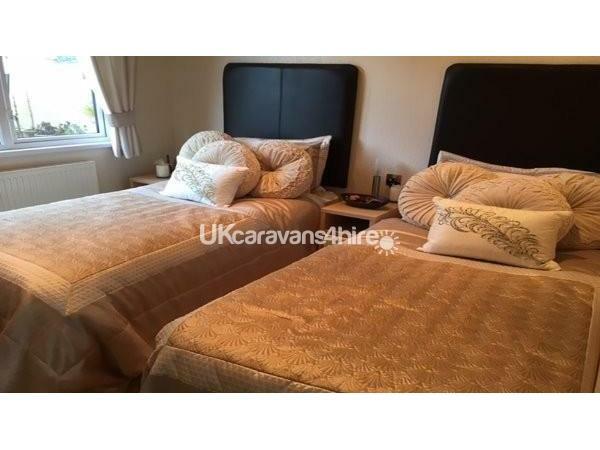 The beds are so comfortable and help to ensure a good nights sleep. The gardens are beautiful, especially when sat out in the evening, as they can be lit up when darkness falls. 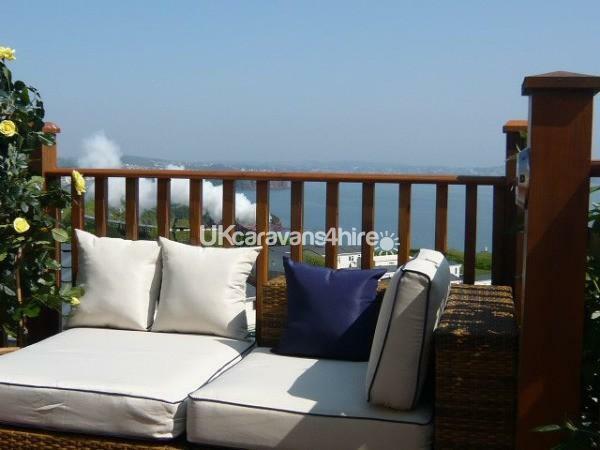 The outside seating and dining area are a bonus, especially if the weather is sunny and hot, with beautiful uninterrupted views over Torbay, you can watch the steam train go by along the coast several times daily. The owner contacted us when we arrived, to ensure that everything was to our liking, ensuring that the lodge had been cleaned and the gardens tended, which was a nice touch. We had a wonderful weeks holiday, would not hesitate to book this lodge again and we would most certainly recommend this holiday accommodation. Thank you for your feedback We are so pleased you enjoyed your week at our lodge. We hope you will visit us in the very near future.